The AD8235 is the industry’s smallest, lowest power instrumentation amplifier. It has rail to rail inputs and outputs and can operate on voltages as low as 1.8V. The ADAS1128 lowers CT system cost and enables enhanced imaging using the industry’s highest level of channel integration and speed. One such Vertical is Instrumentation, here you know Industrial Process Control is one and the other is Test and Measurement. The third branch we learn about today is “Analytical Instrumentation Technologies” which is more like an Oblique, it Cuts thru Physics, Chemistry and Biology and many of its sub-branches. It also supports the areas called Life Sciences, Bio Technology, GeoSciences, Materials Science etc. . Here i have posted some analytical instruments … Laboratory Analytical, – Research and Lab Instruments, Bio and Earth Science. – EEMetric.com – Test and Measurement Instrumentation. 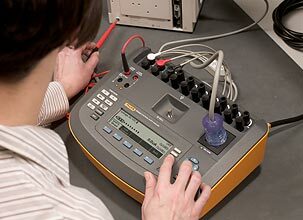 Fluke test tools, answering your electronic, electrical, predictive maintenance and biomedical needs. Shown below is ESA620 an Electrical Safety Analyzer that performs all primary safety tests, including mains voltage, protective earth resistance, insulation resistance, device current, earth, chassis, and patient leakages…..